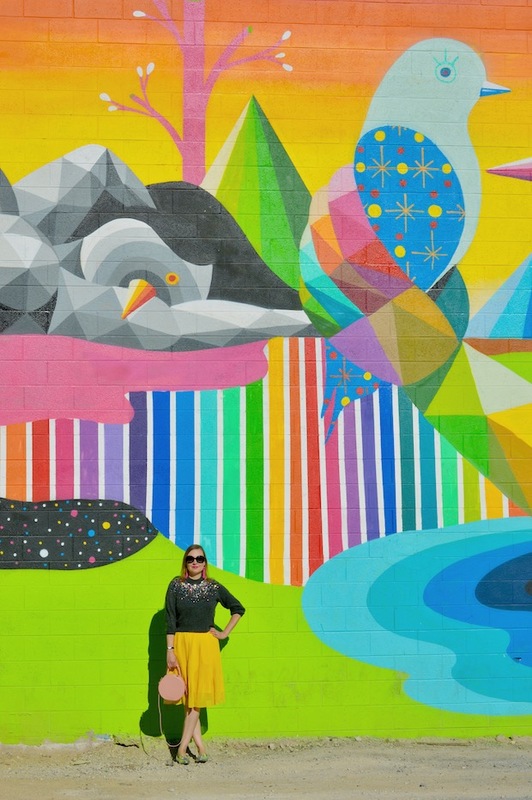 Hello Katie Girl: The Epic Murals of Las Vegas! The Epic Murals of Las Vegas! Las Vegas is definitely over the top when it comes to almost everything, be it buffets, shows, or, obviously, lights. 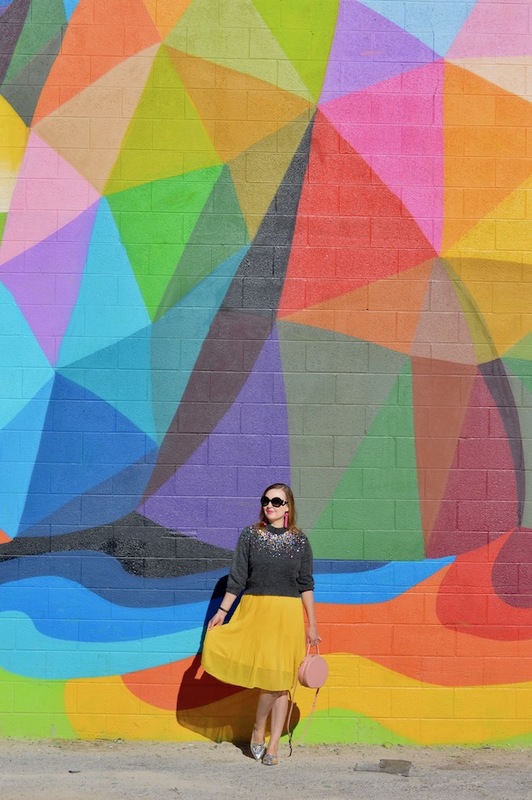 One thing that I didn't realize is that the city is also over the top when it comes to colorful murals and walls! Yes, Las Vegas street art is definitely epic! In fact, they might give Los Angeles a run for its money in this department. These walls and murals can all be found in the old downtown district of Las Vegas, right off of Seventh Street, in case you are in the neighborhood. There's literally a mural around just about every corner, so it's a paradise for wall hunters like myself. 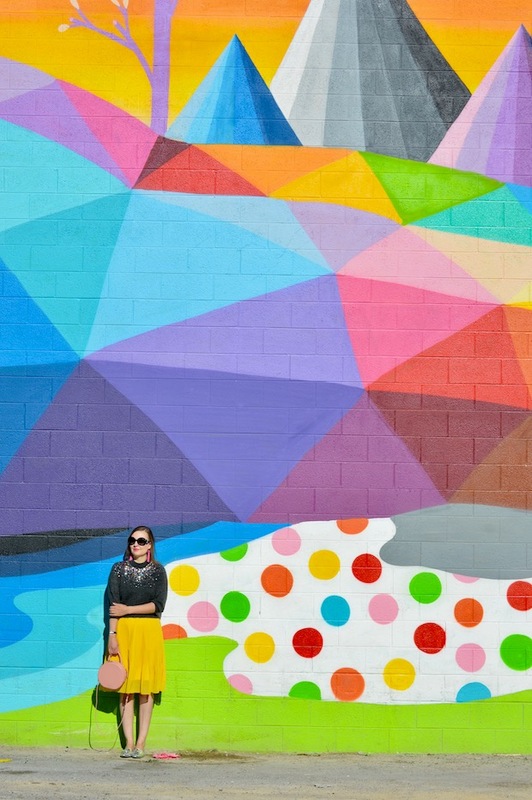 This gigantic, colorful wall was actually not the one I was planning on photographing, but it was so pretty and colorful that I instantly fell in love! There was another wall that I intended to use but, much to my chagrin, there was a dance troupe using it to film their latest dance routine. In fact, there were actually several dance troupes rehearsing and filming in this area. There was also a lady who looked like she may have been the adult industry filming here too. I really must give her props because she was really good at doing outfit changes in her car! Finally, there was a tourist family, each armed with an iPhone, doing a photographic safari of the area, which was pretty cute. Needless to say, Las Vegas murals are popular places! 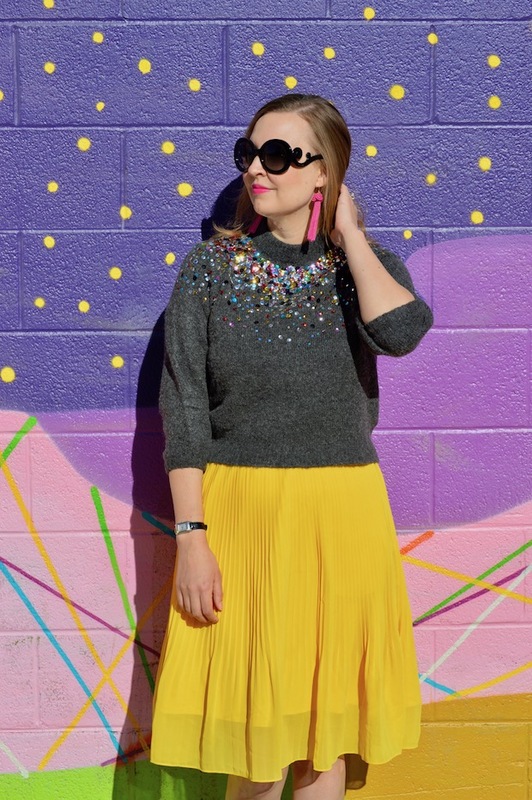 I don't know what wouldn't go with this wall, but I chose to wear this gray sequin sweater that has a lot of Vegas sparkle. 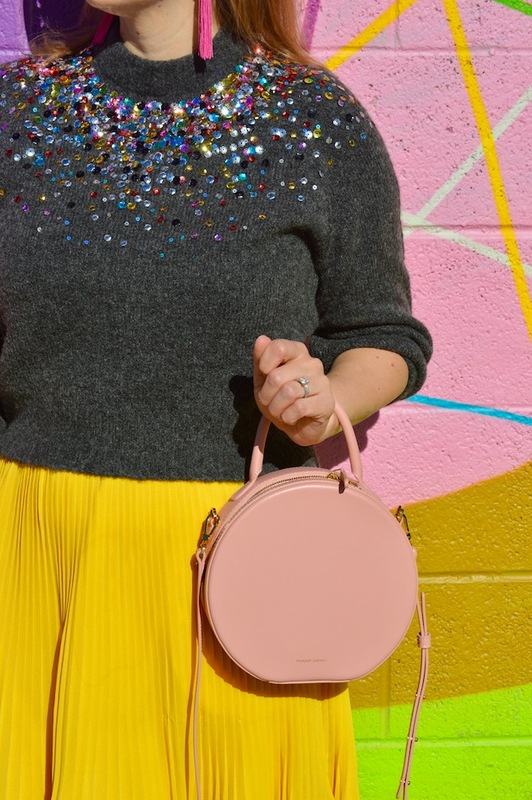 It actually comes in a tan color and I would seriously consider getting in addition to my gray one here because I love the sequins so much! 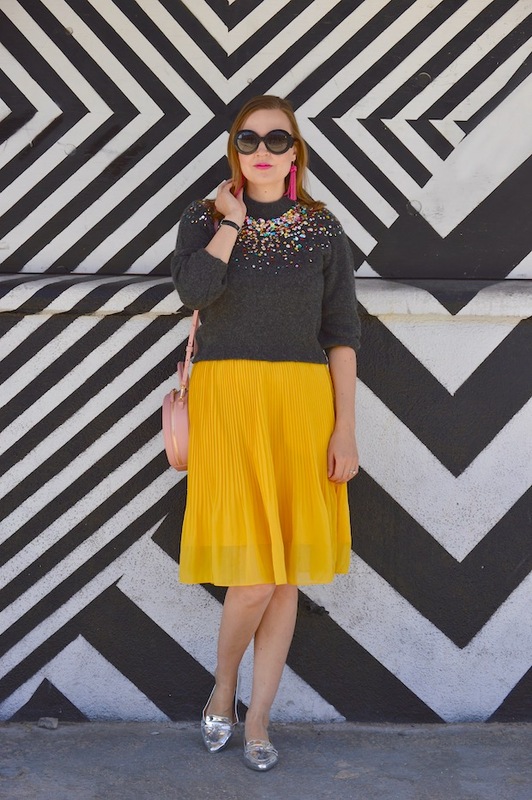 Much like the wall, this sweater goes with everything because of all of the colorful sequins. 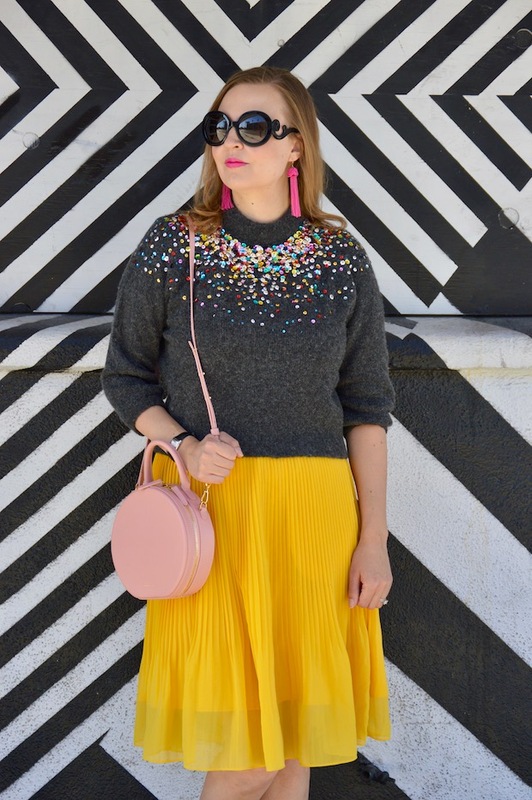 I decided to pair it with a yellow pleated skirt and my pink Mansur Gavriel circle bag to give sweater more of a vibrant vibe. I probably should have brought an extra outfit and done an outfit change (like the aforementioned woman!) but at least now that I know where these murals are located, I can do another photo shoot on our next visit to Vegas. Below you will find my runner up for favorite wall in this area of Las Vegas. You can never go wrong with classic, graphic black and white. 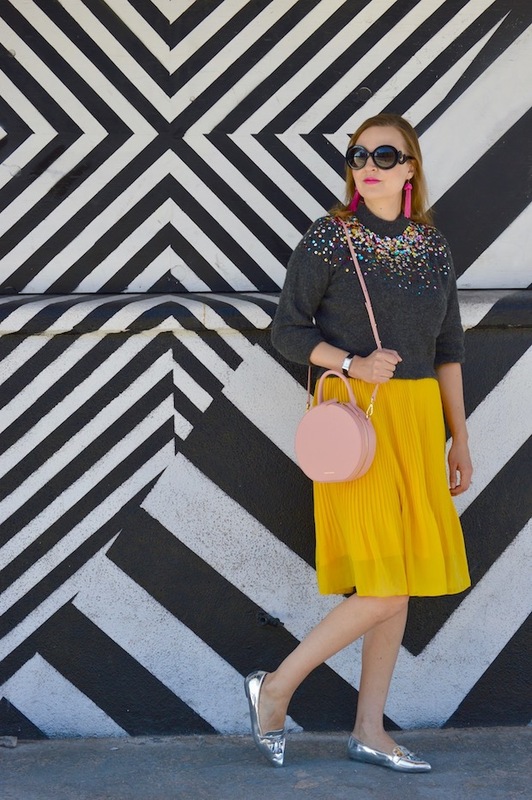 It's a nice contrast to all of the colors in the first wall and really makes an outfit pop. 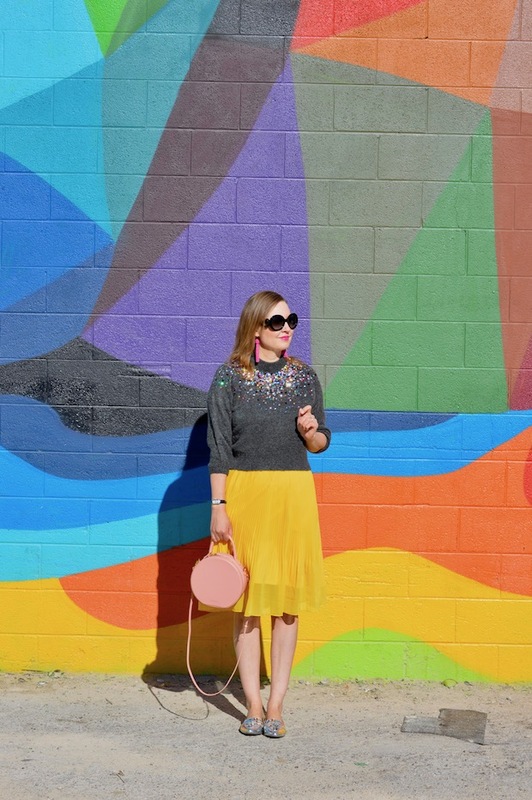 Next year perhaps I'll feature another outfit and some more of these vibrant street murals! 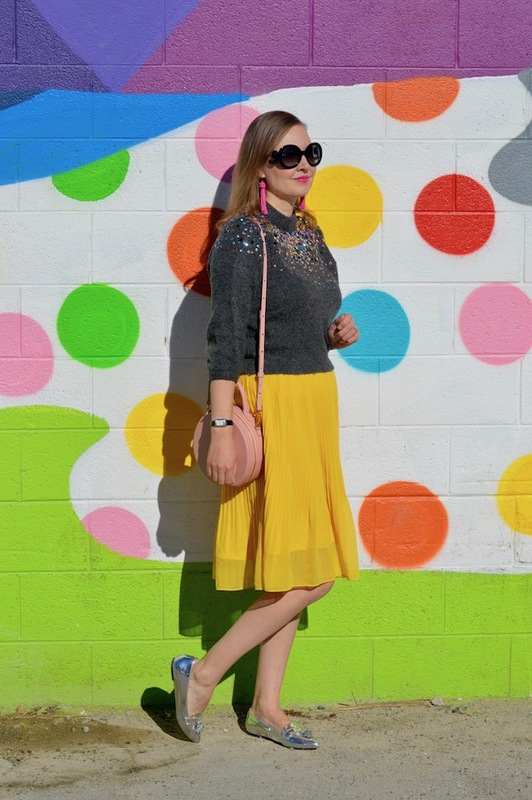 This outfit is fabulous and goes so nicely with this colorful wall! 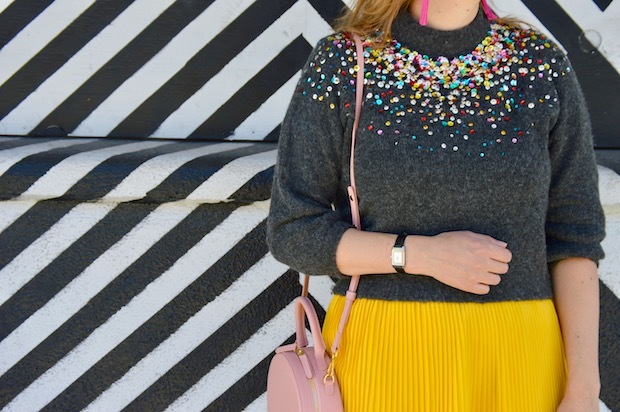 I do love pops of yellow in the winter!